Capturing the festivities at Sunday's festival. Tomorrow there will be a new competition. Wow, that's a great close-up. I like the black and white/colour impression. Love the framing to get the colour against the charcoal sketch. Sometimes people do this in photoshop etc, but it's much better when it's 'for real'. 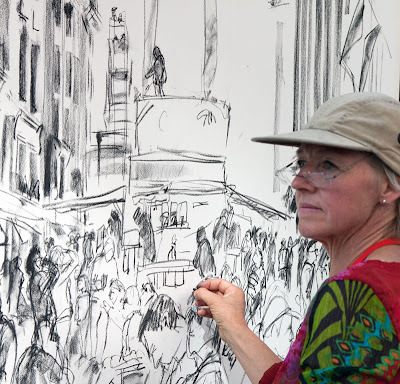 The charcoal sketch has captured the vitality of the festival & you have captured the artist in a great shot. I feel she's about to get into the picture herself, adding a bit of colour to the painting! Absolutely beautiful shot! Wonderful photo of the artist! I love festivals like that! I didn't do a fraction of what you do when I lived in London. But I can live so much of it through your photo's. It is firing up in me the desire to get my botty down to London and do the tourist thing. We keep talking about it as we are only sixty miles away from Euston, an hour on a fast train. How daft is that? thanks for reigniting my love for this vibrant city. like a medium in a medium, reality in a reality -- tres postmodern! I love this shot. The energy of her sketch and the color of her against the black and white. Truly brilliant.